A Whisk and Two Wands turns 4 today! What better way to celebrate than to have cake, cake for breakfast, in the form of a smoothie bowl! 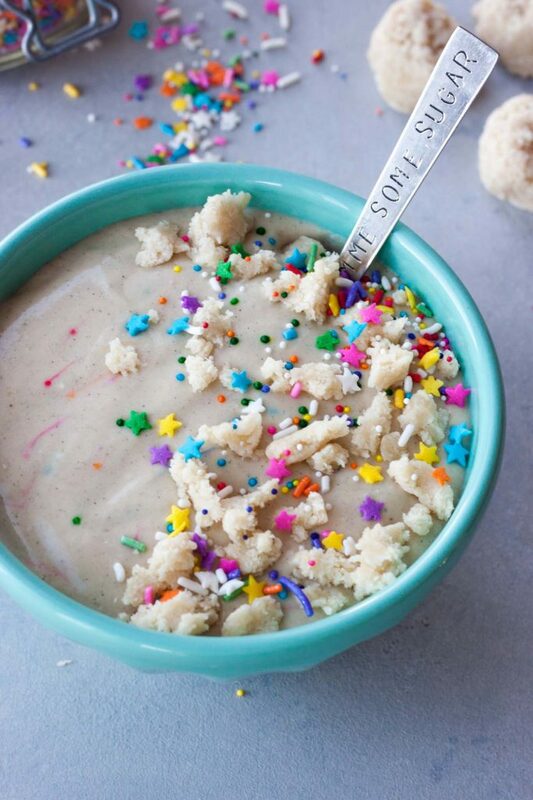 No worries there is no actual cake mix used in this fun smoothie bowl, hence the “no cake” it’s packed with good stuff, and yes it’s delicious! Usually I save my no cake recipes like my Birthday No Cake Protein Shake 2.0, Birthday No Cake Shake, and Birthday No Cake Overnight Protein Oats for my birthday next month, but like last year I’ll be in California. I’ve been holding on to this recipe too long and I can’t hold it in any longer so today was the perfect day to share it! Plus 3 of the products in this Funfetti No Cake Protein Smoothie Bowl are part of my Blogiversary Giveaway on Instagram this week! Yep I’m giving away So Delicious Products, a big Vega prize pack (with full size tubs, bars, and more! ), and Hail Merry Bites! If you’ve noticed lately there seems to be a common theme in my dessert smoothie bowls, frozen chickpeas! If you still haven’t tried it I’m telling you it isn’t as weird as it sounds and you won’t notice them, other than the fact that you’ll have a super thick and creamy smoothie bowl. I also add in some banana but just adding a little for sweetness and to balance out the chickpeas. If I just did bananas you would taste them more and it would be less cake like. Other benefits of the chickpeas is it cuts down on the sugar, ups the protein and the fiber. This means it will help keep you full longer. I like to enjoy this smoothie bowl post workout but it’s great and guilt free anytime. I add in my favorite Vega Protein, Clean Protein (you can get this at Target) or Vega Sport. Which one I use depends on my needs for the day. I think both the vanillas have a cake like, or angel food cake, like flavor to them. Vega has been my plant-based protein of choice since before I started blogging, my tummy just handled it better than other protein powders. It’s my personal preference and you can use what you like but I can’t say it will taste the same as I haven’t tried others. Vega is gluten free, dairy free, vegan, and soy free. I still add in a little coconut flour and almond extract for that cake like flavor that isn’t overly sweet like cake. I also add in maca powder, which is optional, as I always add it to my pre and post workout smoothies and smoothie bowls. Now for the fun, SPRINKLES! These are not optional, sorry they just aren’t because it wouldn’t be Funfetti and it wouldn’t be as fun without them. They make me smile and make everything better. 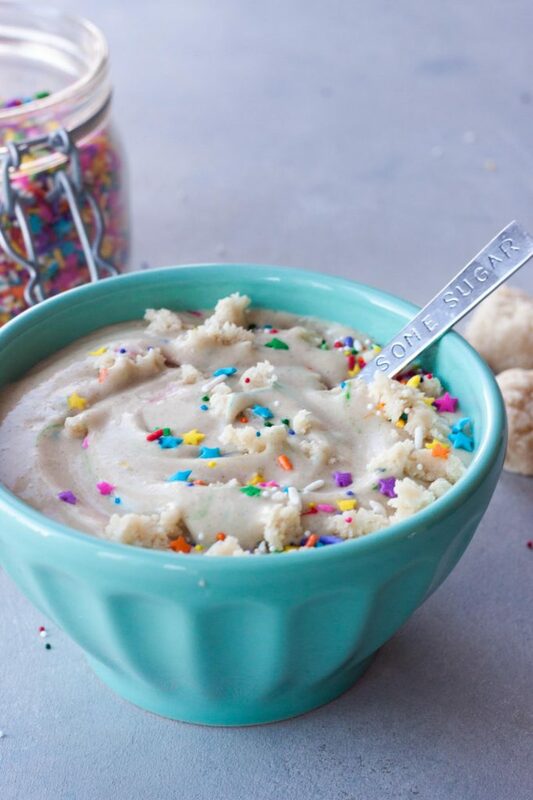 Just try eating this colorful sprinkle filled Funfetti No Cake Protein Smoothie Bowl without smiling, I bet you can’t! I know I said no cake but you are seeing little crumbled pieces on top thinking hey that sure looks like cake. Nope they’re crumbled Hail Merry Pure Vanilla Macaroon Merry Bites! They are so good and one of my favorite snacks, we have a little stash of them in the fridge (that’s were I keep mine) and the girls will put one in their lunch or their a great little snack. They are gluten free, dairy free, vegan, soy free, paleo, and peanut free. Just good ingredients, for instance these Pure Vanilla Merry Bites are made with organic shredded coconut, organic maple syrup, almond flour, organic virgin coconut oil, organic Madagascar vanilla, and sea salt, that’s it! They have lots of great flavors and also have tarts which we love. Of course these are optional you don’t have to add them but they add to the fun so I like to add one, or sometimes two. So quick head over to Instagram and enter to win my giveaway! Today I decided I’m going big and putting together the Vega prize pack and the Hail Merry Goodies! One lucky winner will win 2 tubs of Vega and I’m letting you pick them! Yes vanilla or chocolate and Vega Clean Protein or Vega Sport! A dozen Vega Protein + Snack Bars, and their new Vitamins and Probiotics! Maybe a couple other surprises thrown in. Plus Hail Merry will send the winner Pure Vanilla Macaroon Merry Bites so they can recreate this smoothie or just eat them and some Cookie Dough Merry Bites! After you enter head to the kitchen and whip up this smoothie bowl and celebrate with us today! First make sure you rinse and drain your chickpeas and place in the freezer. If you spread a single layer in a plastic container they will freeze within 2 hours. I keep them frozen in the freezer and replenish them as needed so they are always there. In a Vitamix, or high-speed blender, blend together coconut milk, coconut flour, protein powder, almond extract and optional maca. Once it’s blended add in the chickpeas and banana and blend, using the tamper tool as needed. Pour, scoop, into a bowl and stir in a few sprinkles. Top with more sprinkles and Merry Bites or optional toppings of choice. Smile and enjoy! 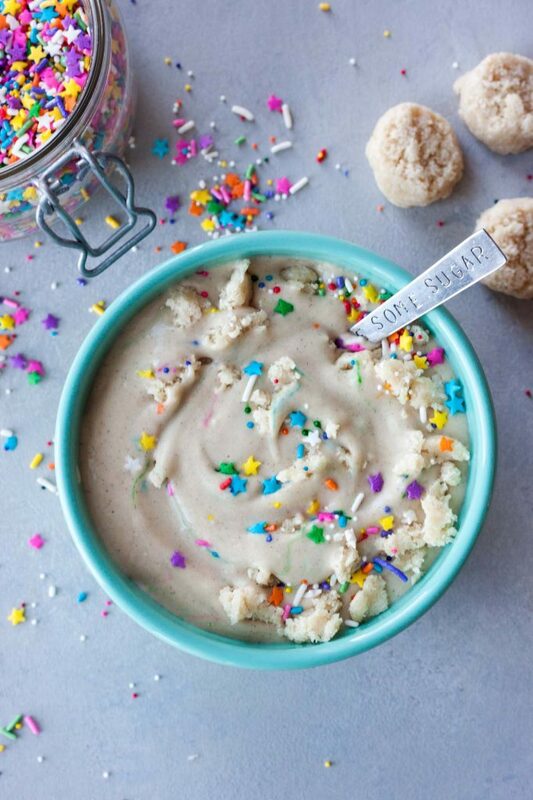 Fun and healthy smoothie bowl that tastes like Funfetti Cake without cake. It’s packed with gluten free and vegan protein, fiber, nutrition, and flavor! They do look like cake! I love to see what you are eating for breakfast each day. Happy blog birthday! This looks delicious! I’m all for healthy reasons to eat cake! Sprinkles make every day smiley and better! This smoothie bowl looks too fun to eat but not quite! Thank you! Chickpeas are my go-to in so many smoothies lately. It’s so good! Happy Blogiversary! This smoothie bowl looks like the perfect way to celebrate! Thank you Alisa! You should celebrate Thursday, because it’s almost Friday! Haha! I’d love to hear what you think if you try it. Love love the idea of adding frozen chickpeas! I will definitely need to try that out. They’re great for making it thick and creamy and adding filling protein and fiber and not just sugar, you have to give it a try! Happy Happy Blog birthday! 🙂 What a perfect and healthy way to celebrate! I love that this has chick peas in it, for extra protein. What a pretty breakfast! Thank you! They are so great for thickening it and adding the filling fiber and protein and keeping the sugar down. Thank you Sonali! No guilt having this smoothie bowl for breakfast, post work, or snack I just love it! Wow, love the addition of the frozen chickpeas in this smoothie bowl! I’m going to have to try this! So fun and a great start to the day! Happy Blogiversary!! 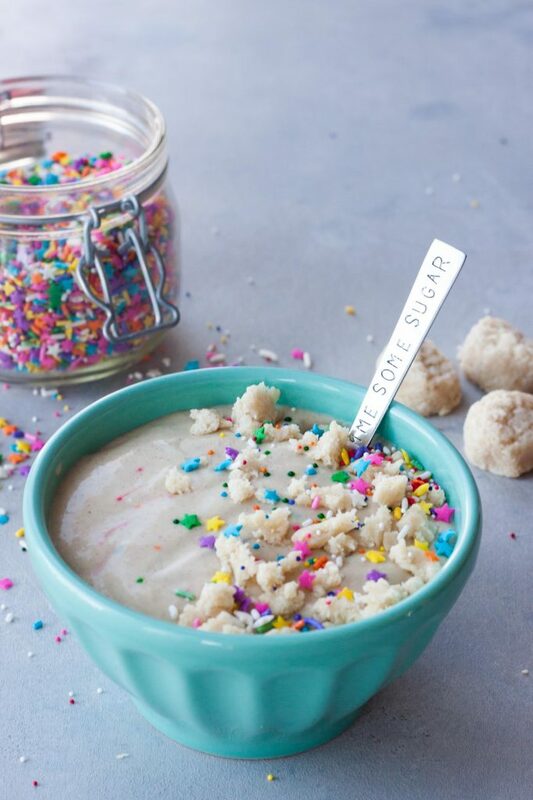 What a fun way to celebrate – this bowl looks so cute & fun. I love the sprinkles!